This joint publication from the World Health Organization (WHO) and the World Organization of Family Doctors (WONCA) provides a concise analysis of the state of family practice in the 22 countries spread over North Africa, the Middle East and Western Asia, i.e. the Eastern Mediterranean Region (EMR) in both English and Arabic. It shares perspectives and advice from global and regional leaders on how family practice can be introduced and strengthened in high-, middle- and low-income countries. The global movement towards integrated people-centred health services: The role of family practice. Scaling up family practice: Progressing towards universal health coverage in the Eastern Mediterranean Region. Universal health coverage: Challenges and opportunities for the education of the health workforce. Proactive primary care: Integrating public health into primary care. 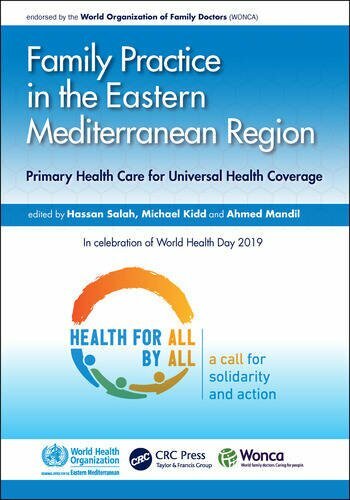 Health information in primary care and family practice: Concept, status, and a vision for the Eastern Mediterranean Region (EMR). Integration of non-communicable diseases in primary health care in the WHO Eastern Mediterranean Region. Family practice workforce: Multidisciplinary teams. Current status of family medicine education and training in the Eastern Mediterranean Region. Leveraging technology to transition general practitioners to the family practice model of care. Measuring the quality of primary health care: A regional initiative in the Eastern Mediterranean Region. The challenge of providing primary health-care services in crisis countries in the Eastern Mediterranean Region. Public-private partnerships: The Mazandaran experience on contracting with private family physicians, Islamic Republic of Iran. Afghanistan. Bahrain. Djibouti. Egypt. Islamic Republic of Iran. Iraq. Jordan. Kuwait. Lebanon. Libya. Morocco. Oman. Pakistan. Palestine. Qatar. Saudi Arabia. Somalia. Sudan. Syria. Tunisia. United Arab Emirates. Yemen. Hassan Salah is Primary Health Care Regional Advisor, and Integrated Service Delivery Team Lead, Eastern Mediterranean Regional Office, World Health Organization. Salah is a medical doctor, with a Master’s Degree from Harvard School of Public Health. Michael Kidd is an Australian family doctor and medical researcher. He served as WONCA President from 2013–2016. He is Director of the WHO Collaborating Centre on Family Medicine and Primary Care, and Professor and Chair of the Department of Family and Community Medicine at the University of Toronto in Canada. He also has academic appointments with the Murdoch Children’s Research Institute in Melbourne, and as Honorary Professor of Global Primary Care at Flinders University in Australia.